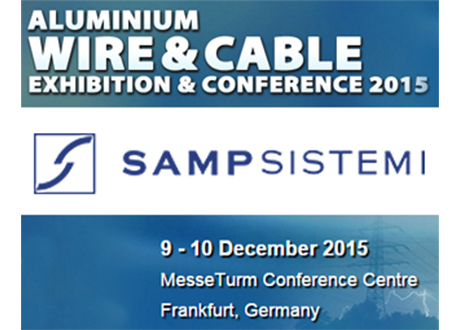 On December 10th, Sampsistemi Engineer Enrico Conte presents: “SAMP solutions for the aluminum wire and cable manufacturing” at the Aluminum Wire & Cable Conference 2015 in Frankfurt. The wire South America show (Sao Paulo, October 6-8, 2015) has definitely confirmed its status as the most important international trade fair for the wire and cable industry in South America. 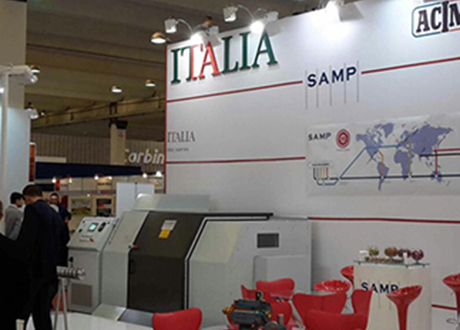 SAMP, a company of the Maccaferri Industrial Group and leader in the wire drawing and extrusion technology, was present with some of its latest developments, such as the best-selling Double-Twist Bunching Machine BM 630 and a state-of-the-art Extruder SAMP 120-25. A number of extrusion heads developed by the long-standing technology partner CJ-TEK was also on display as the perfect complement of SAMP extrusion lines. Also its well-known Brazilian partner Cortinovis do Brasil was present on the booth. Together, SAMP and Cortinovis do Brasil introduced a joined company portfolio that allows them to be the first and only supplier in South America to locally produce the entire manufacturing line for wire and cable, from rod breakdown to the extrusion process. Giovanni Cinti, Sales Area Manager for South America, added: “Thanks to the exhibition, we got in contact with new potential customers not only from Brazil, but also from other South American countries like Argentina, Venezuela, Peru etc. Therefore we can affirm without a doubt that the wire South America surely met and even exceeded all of our expectations.” SAMP would like take this opportunity to thank all customers, partners and suppliers that visited the stand and hope to see them again at the next wire South America in 2017! Our production and service facilities are located in Bologna (Italy), Shanghai (China), Williamsport (USA), Moscow (Russia) and Pune (India). Moreover, we work through numerous representatives all over the world. 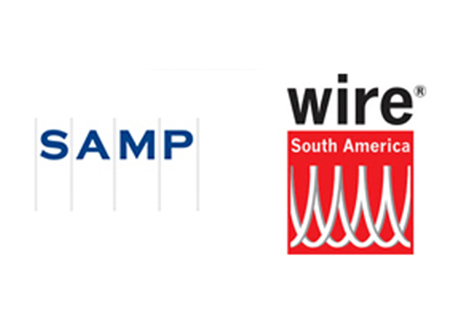 SAMP is pleased to participate to the 2nd edition of Wire South America – San Paolo SP Brazil, from 6th to 8th October 2015, at the Booth 605 – A. This is the second time for SAMP to participate to Wire South America. At the last edition we had been positively surprised not only about the high number of visitors, but also about the good quality of meetings and discussions. Thanks to the exhibition, we hope to get in contact with new potential customers not only from Brazil but also from other South American countries like Argentina and Uruguay. This year at the show SAMP will display a Double-Twist Bunching Machine BM 630 and a state-of-the-art Extruder 120-25. If you want to arrange a meeting, please contact us, so we can schedule our agenda in the best possible way! We are looking forward to meeting you in San Paolo (SP-Brazil) and are at your disposal for any further information you might need. Contact person: Mr. Giovanni Cinti, Sales Area Manager. 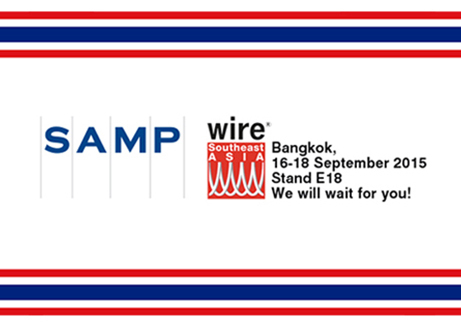 SAMP is pleased to participate to Wire Southeast Asia – Bangkok, Thailand, from 16th to 18th September 2015, at the Booth E18 in the Italian Pavilion. At the last editions of the show we have been positively surprised not only about the high number of visitors, but also about the good quality of meetings and discussions. Thanks to the exhibition, we hope to get in contact with new potential customers not only from Thailand, but also from other countries of South-Est Asia. If you want to arrange a meeting, please contact us, so we can schedule our agenda in the best possible way! We are looking forward to meeting you in Bangkok and are at your disposal for any further information you might need. 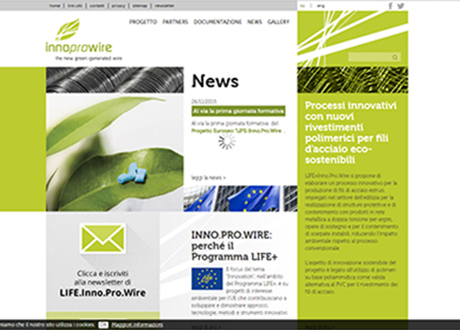 A new website, LifeInnoProWire, dedicated to the all-Italian LIFE-Inno.Pro.Wire sustainable challenge project was launched by its two founders, the Italian multinationals Maccaferri Industrial Group (through its companies Officine Maccaferri SpA and SAMP SpA) and RadiciGroup (through Radici Novacips SpA). Objective of LIFE-Inno.Pro.Wire: to design an innovative process with a lower environmental impact for producing extruded steel wire to be used in metal net protection and containment structures. The sustainability aspect of the project is the use of polyamides as a viable alternative to PVC for coating the steel wire. Now LIFE-Inno.Pro.Wire is on the web. After its official presentation at a kick off meeting last October, the LIFE-Inno.Pro.Wire pilot project – stemming from a partnership between the Maccaferri Industrial Group and RadiciGroup and financed by the European Commission’s LIFE+ programme – is now on the web at www.lifeinnoprowire.eu. The site was designed and laid out in a user friendly way to provide all the information available on the all-Italian LIFE-Inno.Pro.Wire project, which has as its objective the development of an innovative process with a lower environmental impact for producing extruded steel wire to be used in metal net protection and containment structures. Enthusiasm is the word to describe the kick-off meeting for LIFE.Inno.Pro.Wire – an all-Italian pilot project supported by the European Commission’s LIFE+ programme and stemming from the partnership among SAMP, Officine Maccaferri and RadiciGroup – which was held on Wednesday, October 29, 2014 at the Officine Maccaferri headquarters in Zola Predosa (Bologna). 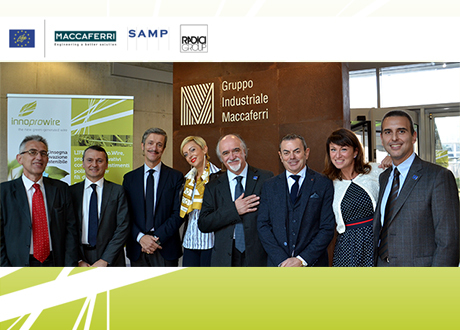 Among the speakers at the meeting were Ruggero Targhetta, sole administrator of EURIS European Research Investments Services, and Stefania Biasuzzi, EURIS project manager; Francesco Ferraiolo, corporate technical director of Officine Maccaferri; Claudio Colibri, corporate R&D manager of Officine Maccaferri; Cesare Clausi, Europe business manager of the RadiciGroup Plastics Business Area, and Erico Spini, marketing & application development director of the RadiciGroup Plastics Business Area; and Roberto Bazzani, sales and marketing VP of SAMP. The target of LIFE-Inno.Pro.Wire is to design an innovative process with lower environmental impact for producing extruded steel wire to be used in making metal net protection and containment structures. The sustainability aspect of the project is the use of polyamide 6 (PA6 engineering plastics) as a viable alternative to PVC for coating the steel wire. Tests will be conducted not only on conventional PA6 but also on PA6.10 engineering plastics produced using 64% biopolymer manufactured from sebacic acid.